Everyone's favorite FBI agents are going head-to-head with everyone's favorite (non-sparkling) vampires in a new comic series. Comic crossovers are always a gamble. For every Batman vs. Predator, there's a Godzilla vs. Barkley. Wildstorm and IDW are clearly looking to recreate the magic of the former crossover rather than the awfulness of the latter. The companies are teaming up to bring the characters of The X-Files and 30 Days of Night together in a miniseries starting this month. The new miniseries has some impressive talent involved in the project. 30 Days of Night creator Steve Niles is co-writing the comic with Tool guitarist Adam Jones, and artwork is being handled by Tom Mandrake (who recently worked on The Spectre). The plot certainly sounds interesting, based on the official synopsis: "When evidence of a possible cannibal killer in Wainright, Alaska draws the attention of the FBI, Agents Mulder and Scully draw the less-than-glamorous assignment. But all is not as it seems once the agents are on the ground. Not only has the long seasonal darkness begun to fall, but there's something unnatural about a few of the locals. And what does a chilling, mysterious black ship have to do with the murders?" io9 has the first few pages of the comic available for preview, and it actually looks like this has the makings of a pretty decent crossover. 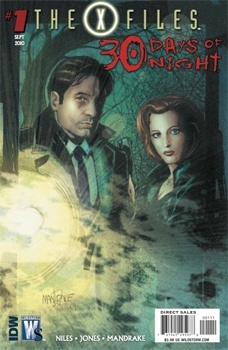 Fangoria loved the first issue, though the site noted that the start of the series is more focused on Mulder and Scully instead of the vampires. Hopefully Eben and Stella will make an appearance, though nothing's been announced. The first issue of the miniseries is due in stores next week.